Today is the Summer Solstice and my first day of celebrating the Pagan/Wiccan Wheel of the Year in my own fashion. I've always leaned towards a simpler and more meditative expression of my faith with simple goals for the seasons; more mindful process. Today is "The Day of Lights." A day where Christmas lights, slightly longer daylight and warmth abound before the axial turn and the next astronomical waypoint of Earths orbit. A day to contemplate what to you choose to burn away and what to you want act upon to stay bright and content. A day to be thankful for what you learned and what brought joy. A day to farewell to the trails of the past season; taking only what you learned about yourself forward. This will become the point of light with that will keep you strong in troubling times. So radiate, enjoy life and my your heart stay bright and warm. Solstice greetings to all. Friendly reminder. When a creative friend shares their work, please at least acknowledge it. Sharing is not only caring but supportive and gives them hope that it's all worth it. "But you should be proud of your work." But of course I am. Once more louder for everyone in the back. I LOVE WHAT I DO BUT WHY SHOULD I PUT MYSELF THROUGH THE ANGUISH OF PROMOTING AND HAVE IT FALL ON DEAF EARS? WHY HAVE FRIENDS SAY THEY LOVE MY CREATIONS AND NEVER SHARE? IT ONLY MAKES ME UNCERTAIN OF MY TALENTS, UNWILLING TO CREATE OR PROMOTE AND INSECURE OF MYSELF IN GENERAL. DON'T inbox me your praise and that. PUT YOUR INTERNET WHERE YOUR MOUTH IS and SHARE. YOU ARE MY PROMO TEAM. BE. PART. OF. THE. TEAM. I'm ever grateful when friends share my music. Always a pleasure to see. Dave just blogged the links to not only myself but two other amazing artists that are close to my heart. 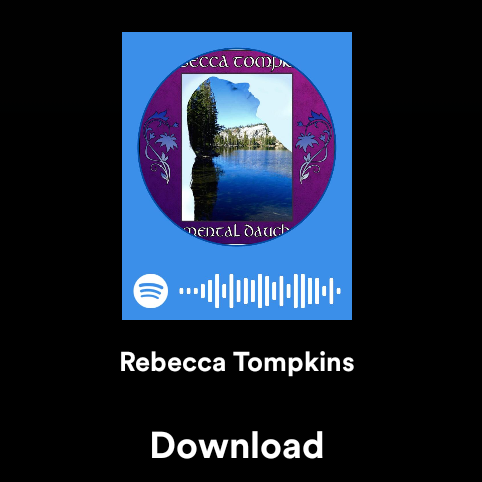 https://songwhip.com/song/rebecca-tompkins/elemental-daughter Just found a place where you can get all the links in one place. 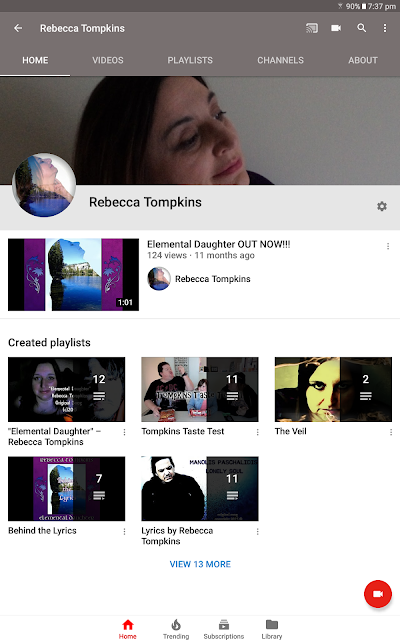 Here's the links for the title track of Elemental Daughter. Oh what a Sunday! The journey of the next album has begun. The first of two tracks has reached rehearsal stage. Hoping to record soon. Are you "ready to fall" with me into the 'liminal'? Time will tell. Well, the time's are a changin'. I found myself emotionally disconnecting with the name Mum's the Witch over the past year and desired; felt disjointed. 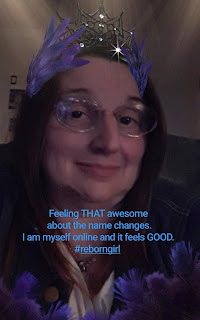 So a few weeks ago, I bit the bullet and changed all my social media in the best way to connect all aspects of me; not just the mother vlogger or the witch but ALL of me, woman, writer, singer, songwriter and creatrix of lyrical inspirations. How? What way to cover it all? Simple; with my name. I feel much better for it. Mum's the Witch continues as a title for my vlogs. Most of my URLs will change where possible or warrented but not too fussed either way. Whar matters is what you see when you click; all of me and what I am willing to share. Hope I remember to blog here more.